manila fashion observer: It's Baaacccckkkk! 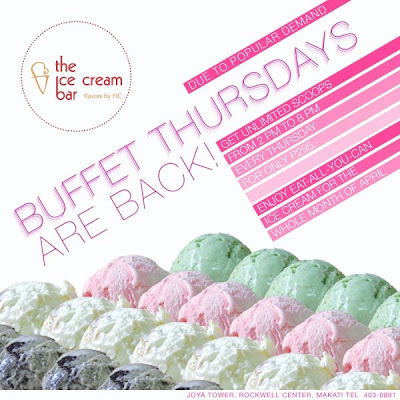 Buffet Thursdays at The Ice Cream Bar! It's Baaacccckkkk! Buffet Thursdays at The Ice Cream Bar! If this doesn't make you go and run off to Rockwell now, I don't know what will! wow thanks for the info. 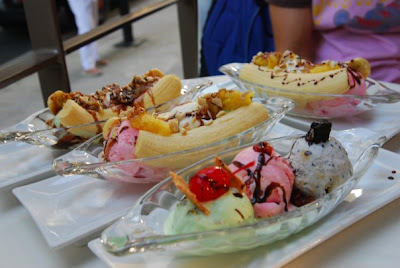 i am cravingh for ice cream now! yey! not pregnant anymore! can binge on ice cream again! You're welcome Mabel! All the best on your pregnancy too! Conci, you mean to tell me ice cream bingeing is bad for preggies? But I've been doing that a lot! Hahaha! have you tried 16handles? if you haven't, then you must. gosh. talk about delish! they have bestest frozen yogurt yet. for someone who used to always say froyo is the rancid version of ice cream (usually tasting the distinct probiotic content i suppose), i've turned around and gained a newfound respect for it. actually, 16handles' may be the only froyo i'll acknowledge. no offense to anyone but it def altered the way i look at ice cream altogether as well. yup! it's that gooood. inexpensive + yummy + healthier = berry good for everyone! yipppeee! i wasnt able to take advantage of this buffet last december so now is my chance! thanx for the post! that's what THEY say! haha! but my lunch at work wouldn't be complete without a stick or two of popsicle for dessert!